No tour of this part of Cornwall is complete without a visit to Land's End (even if it does resemble a theme park nowadays). And how can we not partake in Cornwall's mining heritage, so a visit to the glorious Geevor Tin Mine near St Just was next on our holiday itinerary. Finally, we enjoyed another scenic Cornish coastal walk, this time from Rinsey Head to Porthleven along the South West Coast Path. 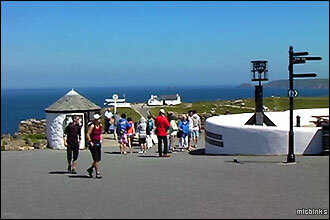 Land's End's a must when touring this part of Cornwall, so off we went on another hot and sunny day to visit this iconic location. The car park cost a whopping £4 (which Mike had a winge about). 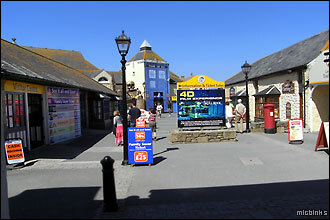 Our prior internet research had prepared us for Land's End's commercialism, but even so it was shocking to see just how much this significant landmark has been transformed into a mini theme park now! 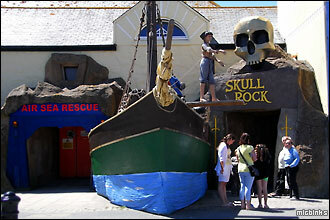 Seen here are two of the five Land's End attractions, Air Sea Rescue and The Curse of Skull Rock, a 4D film experience. Of course Land's End also had a café/restaurant and, OMG, a very large gift shop! 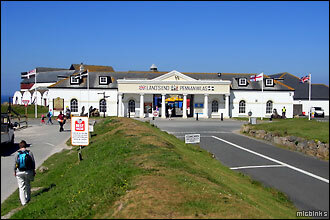 Erm, well, we succumbed and bought a £10 (each) ticket for all five Land's End attractions! 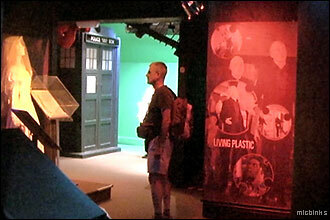 Actually, the Doctor Who one was rather good and included a visual projection of us in alien lands. 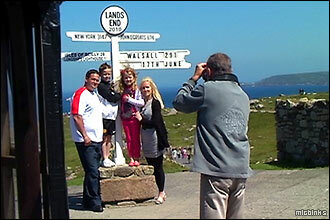 ...to the famous Land's End Signpost where, for shelling out yet more money, visitors could have their photo taken against the signpost with their hometown displayed. Can you spot where this family's from? 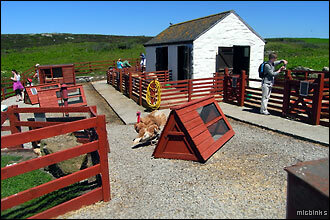 ...at Greeb Farm Mike managed to upset the sheep and Belinda went overtime with the 'ooohs' and 'aaars'. And no, we can't take one home! There were also craft workshops here, all designed to extract yet more money from visitors! 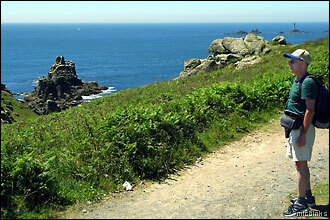 Now this is the real Land's End! 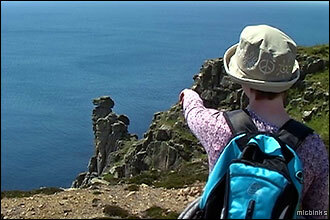 We took time out to find a geocache near the coast path; that's the Longships Lighthouse in the background. 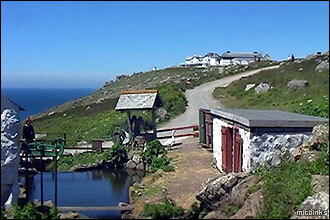 And so onto our next destination, Geevor Tin Mine, in Pendeen near St Just in the far west of Cornwall. 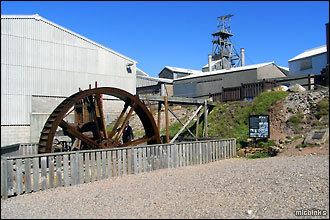 Geevor is a World Heritage Site for Cornish Mining. 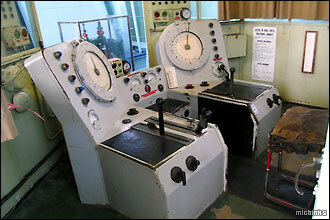 Mike was in his element looking at all the Geevor mine working machinery, this is in the control room in the Winder House. We saw more heavy mine machinery in the Compressor House. In the Mill the conveyors were used to transport and process the rocks but unfortunately weren't operating on our visit. We can well imagine how noisy it would be in here though! Now for our underground tour of the mine! We had to get kitted up in these hard hats and fetching coats; Belinda's the supervisor in red while Mike's the, er, other one in blue! 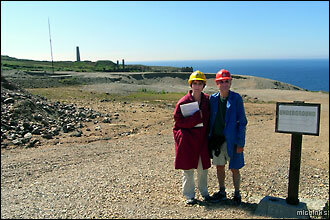 Geevor Tin Mine was in operation until 1990 and as you can see is dramatically situated on Cornwall's Atlantic coast. 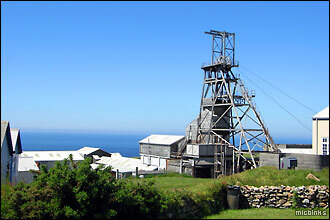 Cornwall has a rich mining heritage, see our UK tourist resources for websites to the places we visit. 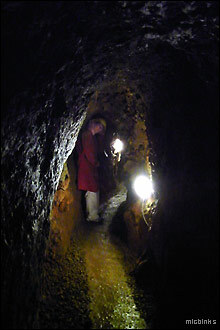 Deep underground in Wheal Mexico at Geevor. We also visited the Dry and the Hard Rock Museum at Geevor Tin Mine, as well as this water wheel. 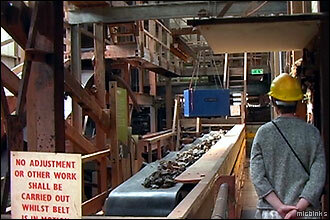 So then, an interesting and fascinating visit to this wonderful industrial heritage site at Geevor. Another hot day in Cornwall, and our second car free one of the holiday with a walk along the South West Coast Path to Porthleven, starting by following the route from the cottage to Rinsey as on our first day. Dunno what's in those Cornish Pasties, but just look at Belinda effortlessly lifting up that huge rock with one arm to retrieve a geocache! 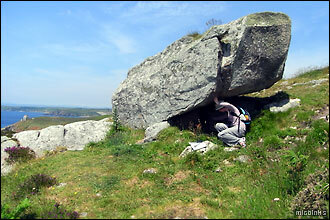 Or maybe she was just trying to shelter from that fierce Cornish sun. 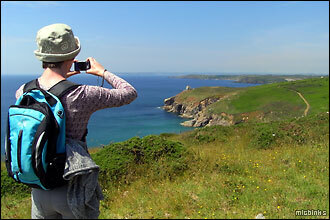 Further along the South West Coast Path towards Porthleven we booked (yes!) our very first Earthcache by estimating the height of Camel Rock here at Trewavas Head. 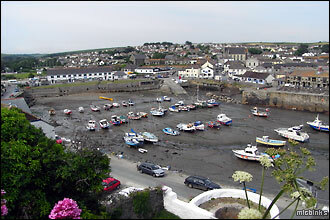 ...Porthleven sure was a welcome sight, we headed straight to the pub for a cooling drink and a meal, before catching the bus back to the holiday cottage... and packing... and homeward bound the next day. 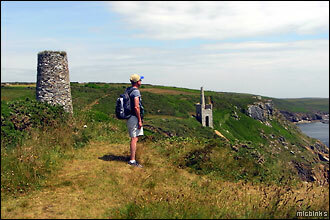 There's more past-times industrial landmarks along our Pembrokeshire Coast Path walks. We've also visited The Needles Park, Isle of Wight and other industrial heritage sites: slate mines in Blanau Ffestiniog, Snowdonia, Clearwell Caves in Forest of Dean, Ironbridge in Shropshire.